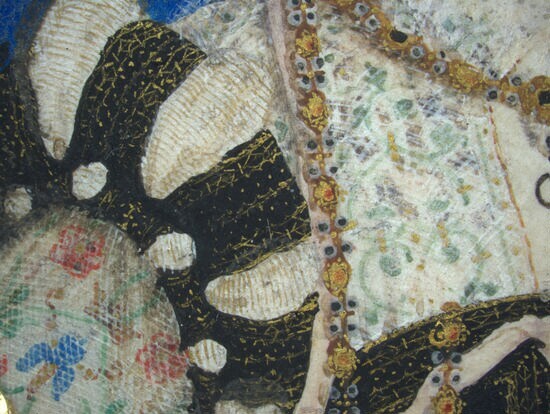 Detail of Elizabeth I's face. 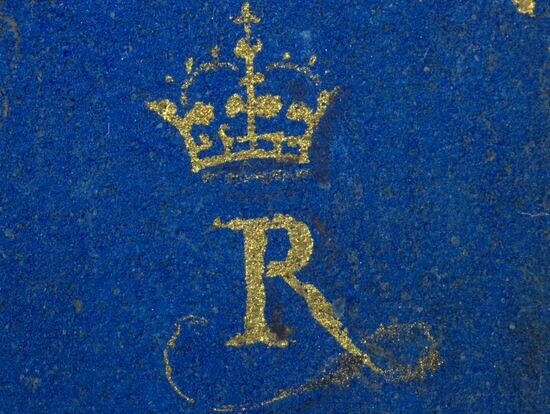 Detail of carefully painted monogram. 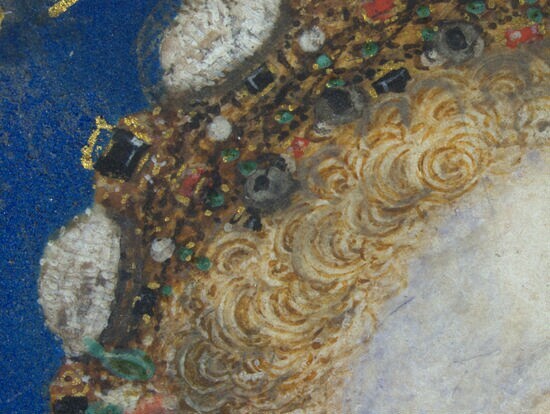 This remarkable picture is the earliest known miniature of the queen, painted when she was 38 years old. 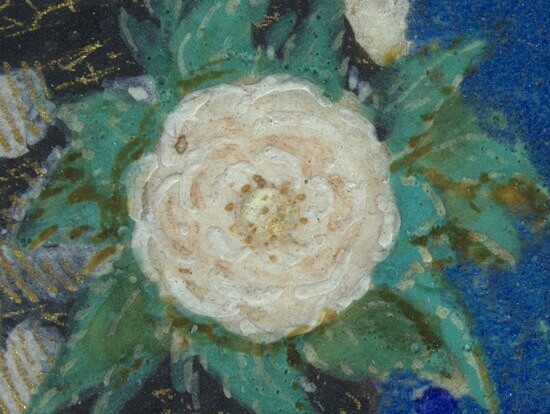 It may be the portrait that the artist, Hilliard, describes painting in his treatise, The Arte of Limning, in which he relates recommending to the queen an 'open light' for miniature painting, with no shadow, for which he says she chose to sit in 'the open alley of a goodly garden, where no tree was near'. 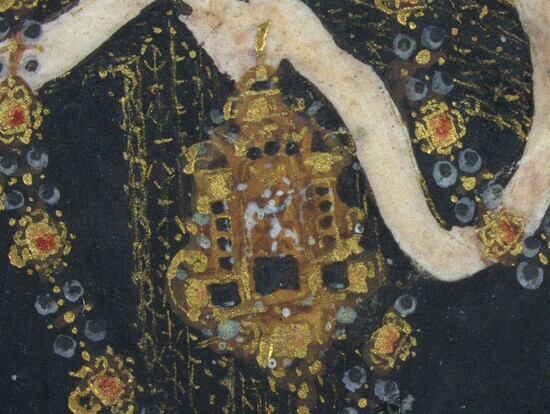 The reverse of the playing card (which is no longer visible) is documented as using the figure of a queen. Thomas Howard, Duke of Norfolk is executed for his part in the papacy-backed Ridolfi Plot to overthrow Queen Elizabeth I. 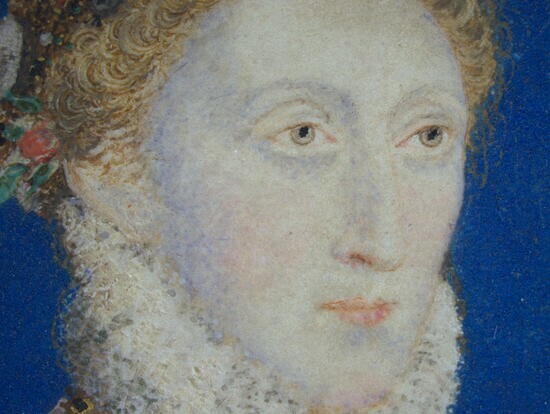 The French prince Francis, Duke of Anjou becomes a potential candidate as Elizabeth I's husband as Parliament makes repeated calls for an heir. Sir Francis Drake plunders Spanish treasure in the West Indies and returns to Plymouth with his spoils the following year. 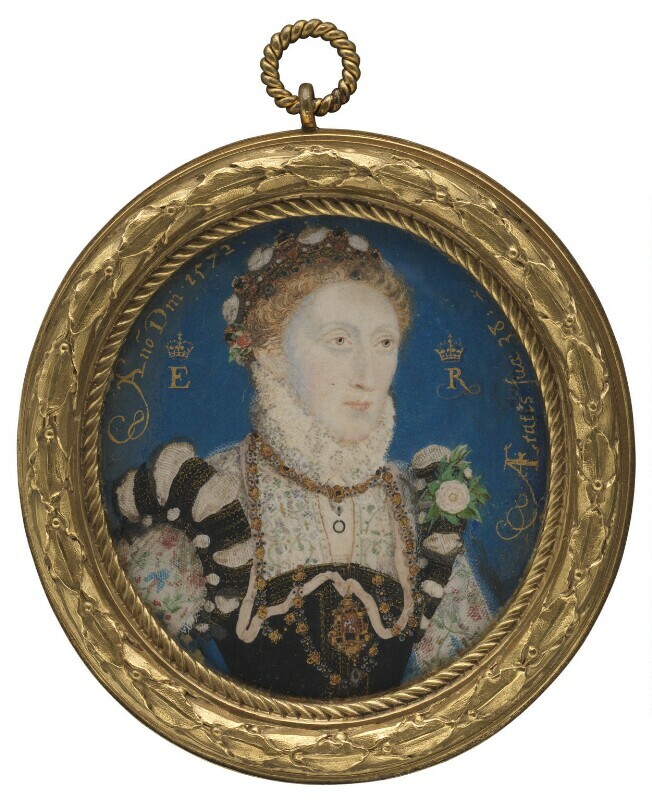 Miniature of Queen Elizabeth I painted by Nicholas Hilliard. The Archbishop of Canterbury Matthew Parker publishes De Antiquitate Britannicae Ecclesiae (Ecclesiastical Antiquities of Britain), which charts the history of Christianity in Britain from the apocryphal arrival of Joseph of Arimathea. Birth of the poet and playwright Ben Jonson. Birth of the metaphysical poet and churchman John Donne. St Bartholomew's Day Massacre of French Protestants (known as Huguenots) takes place in Paris. Under the orders of the queen mother Catherine de Medici and Henry, Duke of Guise, the Huguenot leader Admiral Gaspard de Coligny and thousands of his supporters are killed. Dutch Protestant privateers (known as Sea Beggars) capture the port of Brill, which becomes the first stronghold of the Dutch revolt against Spainish rule.